I decided to have my own topic to showcase my next-generation. Some of them are updated and some of them are revised. I'll update whenever i'm not busy or i'm not lazy. She used to be a joyful and risk-taking young girl, who she often help her parents work in the S.S Louie. But that's when a Munchmore attack in S.S. Louie and was kidnapped by Luau LePunch. She was imprisoned in Munchmore for almost a month, luckily she escaped by Radbert Madish. Radbert was about to open portal using the warp coin but that's when Madlynn is near them and Radbert told her to run fast. Pearl escaped from that place and was outside. 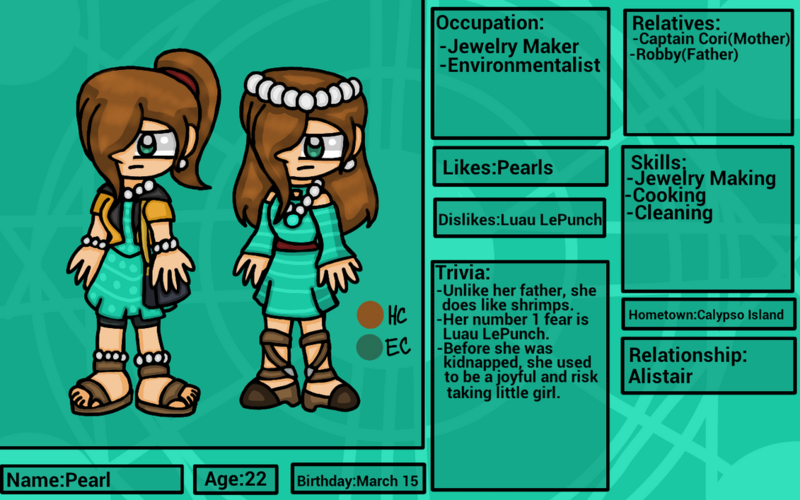 She was hunted by Luau LePunch and run quickly, during her time outside...she encountered many scary places and creatures like cherry bombs that made her traumatized. Few days later, she encountered Rocky Road. Rocky Road recognized the face before and he used the warp coin to open Flipverse. Few minutes later, she was back in S.S. Louie and saw her parents, her parents saw her very scared and messy. For few weeks, she was locked inside her room away from scary things outside. Both of her parents are worried about her and can't see her living like this, so they have no choice but to let her stay in Calypso Island with Nevada. Pearl being scared from being alone, and was worse during her school. 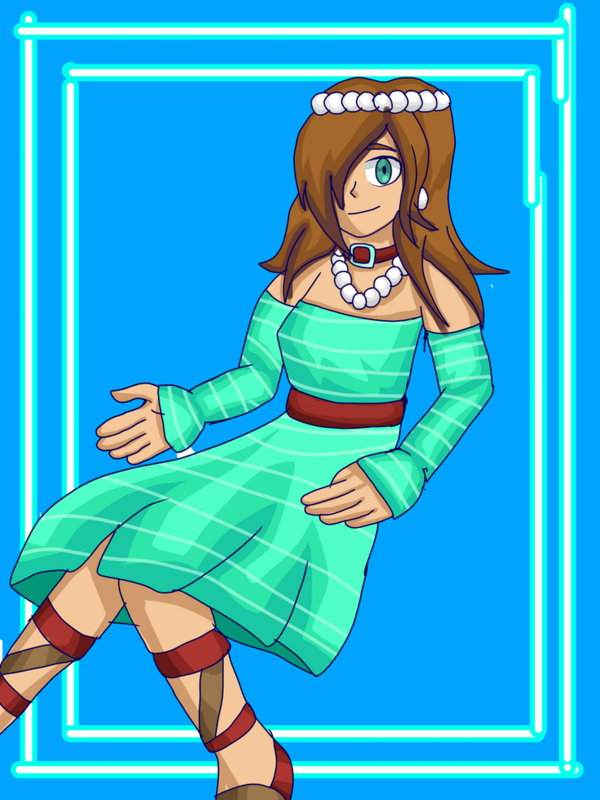 But she does enjoy being with Nevada especially making jewelries that she decided to be jewelrist and sell her creations. One day, while selling some of her creations. She met Alistair and was enjoyed seeing some of her creations. They hangout together that made her have a crush on him. For many years, Alistair and Pearl are now dating. Though it's unknown if his story is true or not. According to Venus, he lost all of his money from the bullies when he was just 6 years old. When he heard about illegal gambling, he decided to try it and he won by luck. He keeps on gambling and winning which made him naughty, greedy, mischievous, and mostly...a liar. He loves to prank and causing mischief around everyone including lawyers, polices, and people working with the law. Many people working with the law didn't want to arrest due to him blackmailing them. 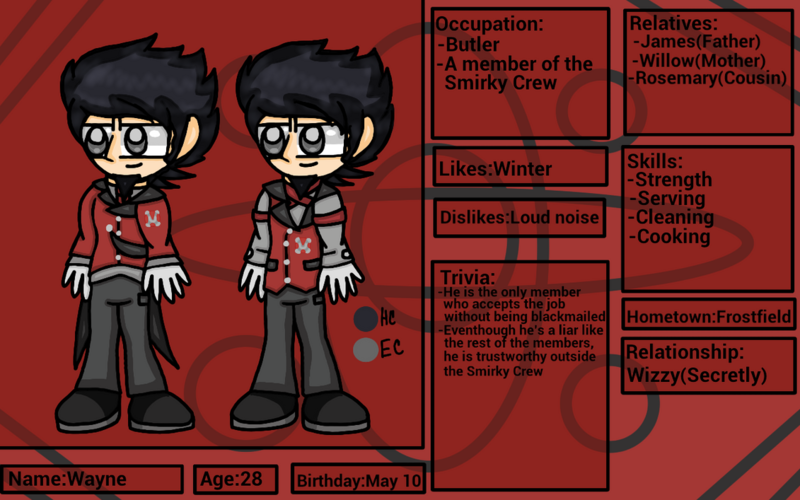 He even is the leader of the group called Smirky Crew, which the members are Sunne Hitwell, Connic Con, Huckle Jay, and Wayne(All of them except for Wayne are force to work for him due to them being blackmailed by him, but they like working with him now). The group cause anywhere and anytime...even time travel. Jessie was a talented girl...she cosplay, playing music, gymnastic and many more but no one appreciate her talents. Some people bullied her for unknown reasons. She even tries joining in many events but no one wanted to let her in. She sometimes feel like the hucklebats who are seem lonely many times, making her like huckleberries. One day, when she was working on making a costume for the costume contest...some stranger stole her outfit. She contact the police about her costume being stolen but the police thinks shes lying. Few days later, she found her costume being worn by someone. She told everyone that person stole but everyone thinks shes lying making her banned at the costume costume contest. For many years she suffered, she decided to be a criminal and make everyone's life miserable for what she suffered. She made her own costumer and disguise herself as "Hucklejay", she stole everyone's goods. During her stealing, she met up with another girl named Connic Con who is also a criminal like her and has the same problem. They decided to become partners and been stealing many goods for the past years without knowing who they are. One day after stealing the bank, they met up Mercury and his bodyguards...Sunne and Wayne. Mercury shown them pictures of there normal selves holding their disguises, putting their money in their hideaway, and many more. Mercury told them that he'll give the pictures to the police if they join his Smirky crew. Both of them have no choice but to accept his offer. At first, they think the Smirky crew is bad but after gaining more money than before...they kinda like being in the crew. He wasn't always a grumpy person, he was a happy and cheerful person like his Timm. He always admired his mother on being a lawyer and he even read some detective stories. 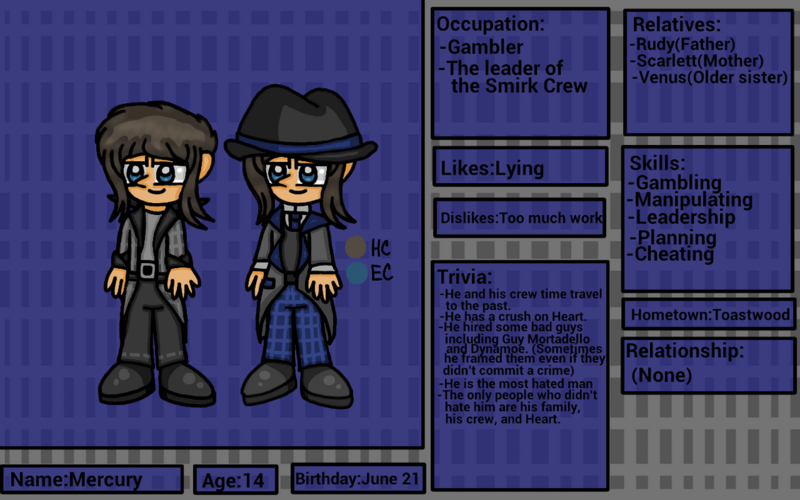 He even friends with Edric when they were kids, and always like to play detective. When he was 12 years old, he got himself a little sister named Pamm and he was happy to spend time with her. Before Pamm's 1st birthday, he and Pamm were in the house alone then suddenly the lights when off and got drugged. When he woke up, the house was a mess and Pamm wasn't around but his parents is. For few months, he been sad and crying that time which he decided to find who kidnapped her. During his time investigating with Edric, he saw the Gigaloaf lab exploded. He and Edric decided to investigate and reveals it was Francine who exploded. Many admired their work that they decided to solve some cases. 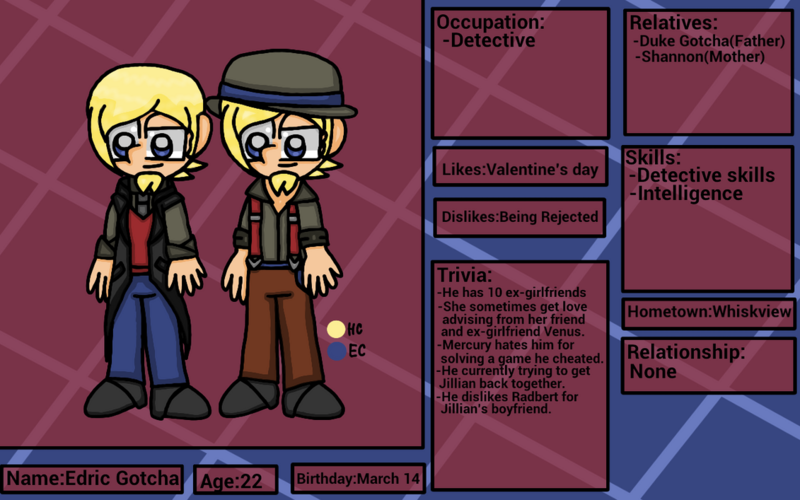 This led to Finn's grumpiness and lack of happiness, he decided to be a detective with more time on finding Pamm and ended up being a detective with his partner Edric in their own detective agency. One day, he met a little girl named Plumm who she attacked his dad. They argue which led to an rivalry, but few months later it discovered that Plumm is Finn's long lost sister. When Plumm discovered the truth, she decided to ran away from her foster home and returned to her real family. Radar dreams on travelling to Munchmore and learn about the Munchmore creatures thanks to her parents who are big fans of their 'hero'. 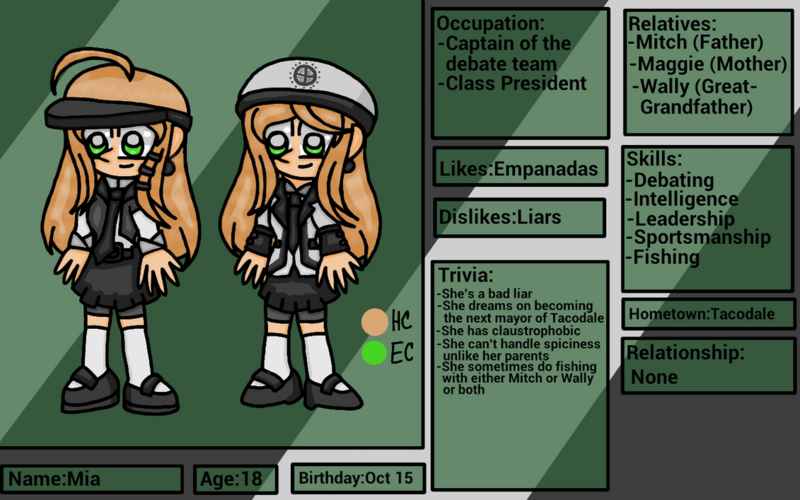 She decided to study hard which lead to many awards and higher grades that made her have a scholarship to Eclair Academy. She even got Iggy, who is her hero to picked her as a assistant which made her happy. Well most of the time, whenever Francine is around to cause trouble. She hopes one day to be scientist like Iggy and travelled to Munchmore. 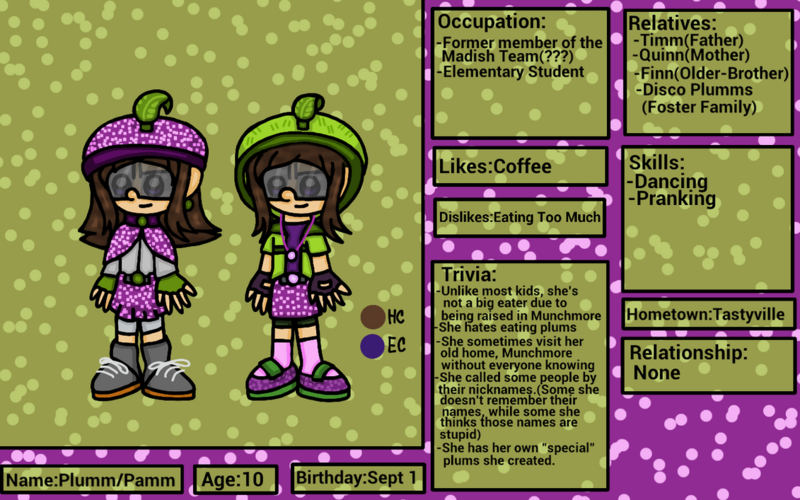 She also visit Oniontown to her parents, and sometimes argue her twin brother Sergeant. She grew up in Calypso Island, which she live her life as a summer girl. She was also born with a beauty but her parents thinks it's a curse so they decided to cover her eyes using her hair. She grew up learning how to do all kinds of arts and crafts, especially some totems. She decided to open a business and sell her totems to locals and tourists. She even sells some other arts and crafts and paintings. 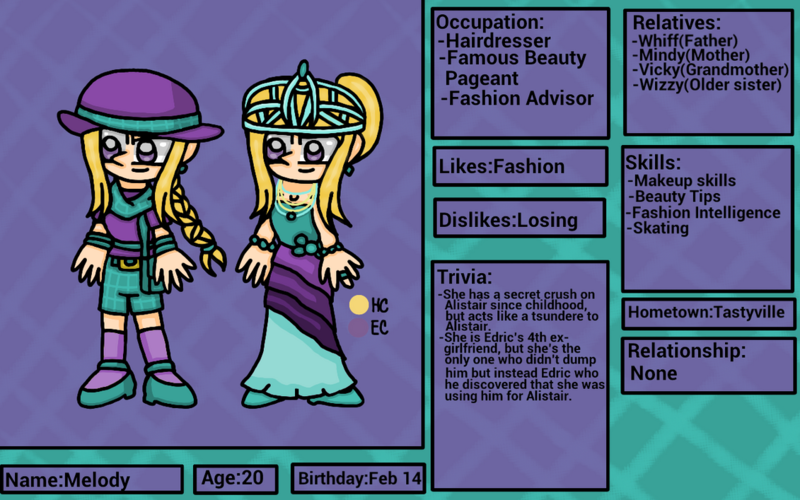 Despite being Penny and Alberto's daughter, she dislikes romance since she thinks their to dramatic and gross. She even met Cody who has a huge crush on her since he saw her beauty. She thinks he's a stalker but she admires his artistic skills. Xelena was born in X-world where her aunt Xandra and uncle Xolo was in. Since Xandra and Xolo are childless, they decided that she'll be the next guardian of the warp coins. 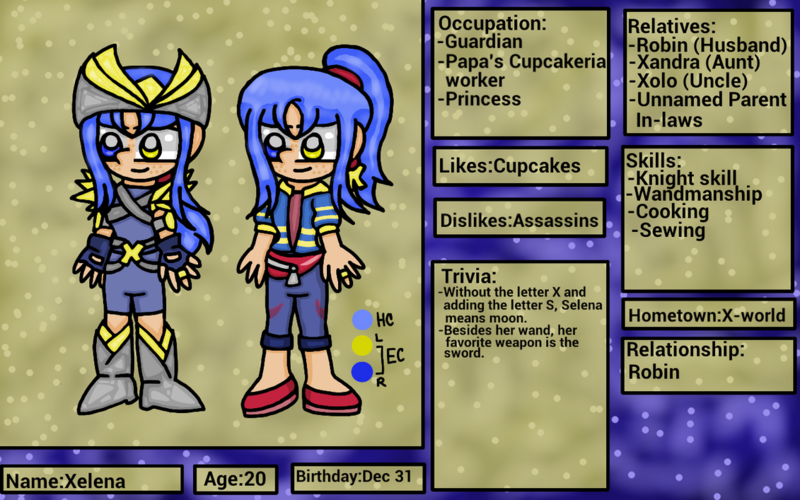 After she was born, she was kidnapped by assassins and was taken away somewhere far. Luckily, Robin saved her from them and returned to her home. 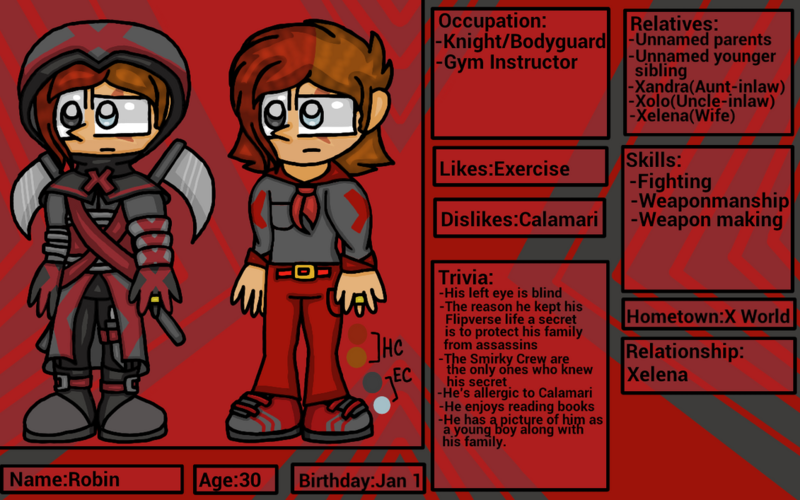 Xandra and Xolo was so thankful to Robin that they made him a squire and bodyguard to Xelena. 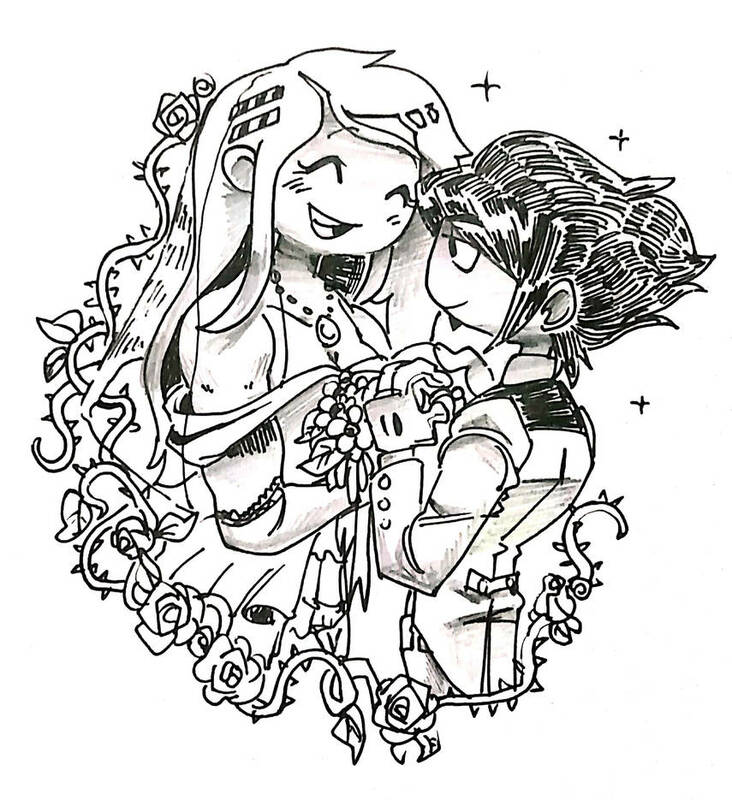 During her childhood, she always help Robin and be friendly to him. That made her have a crush on him. When she was 10, she was suppose to received the wand but was stolen by assassins. She was sad for many days, that Robin even confront her. For few minutes, they confess they love eachother and became a couple. For 6 years, they now got married and happily together. At the age of 20, the wand was now returned and she received the wand. Xandra and Xolo decided to take their niece to Flipverse for not just for her training but for her protection from assassins. And so Xelena along with Robin who will protect her, are now in Burgerburgh with her foster grandmother. Since she loves cupcakes so much, she decided to work at Papa's Cupcakeria for a employee discount (Robin thinks she go crazy for cupcakes). Mia always wanted to make Flipverse a better place. 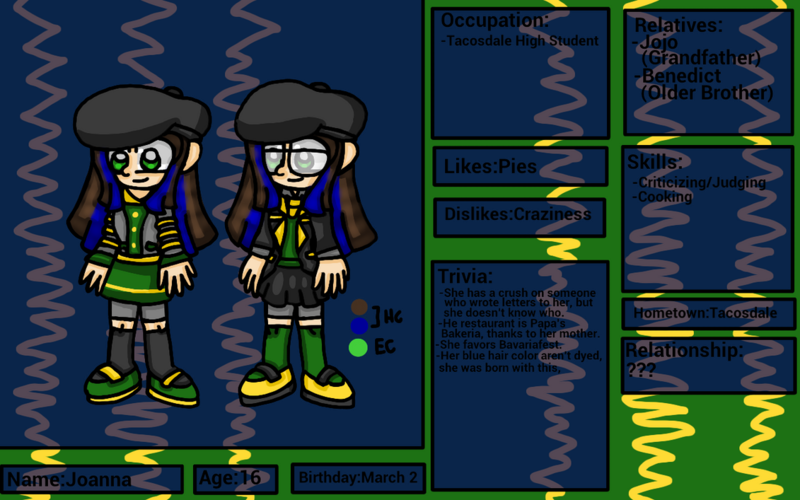 Since she admired her mother being the mayor, she decided to become the next mayor of Tacodale when she's older. Her childhood until now, she studied very hard to keep her grades well and she even do many responsibility and leadership. Thanks to her leadership, she became the class president at her school and the captain of the debate team. While not doing those stuff, she went to every Papa's restaurants for a quick meal. Wayne grew up in Frostfield with his parents, but during summer break...his aunt and her family came. He always spend time with his aunt who he sees him as true lady but with a little evil. Thanks to that, he learns to be a gentleman who is but also cause trouble around. He even took martial art classes to learn to fight. When he grew up, he decided to be butler and worked with Georgito but was fired since he discovered Wayne was causing trouble. After that, he decided to look for a boss who is so bad and evil. One night, he saw a group of men hurting a boy which he heard that he cheated during the game. So he decided to fight the group of men and he was victorious. After that, he discovered that the boy was Mercury and he heard that he is the biggest liar and gambler in Flipverse. He decided to asked him to worked with him as his bodyguard and butler. Mercury accept his offer and they formed a group, while Wayne serve him. Francine grew up in Starlight city with her father Iggy. She always admired her father inventing new inventions just like how her great-grandfather does. She decided to invent something and keeps inventing so much that leads to her craziness and her troublemaking spirit. That leads her not to have friends. She's also responsible for the bomb explosion on the Gigaloaf lab. 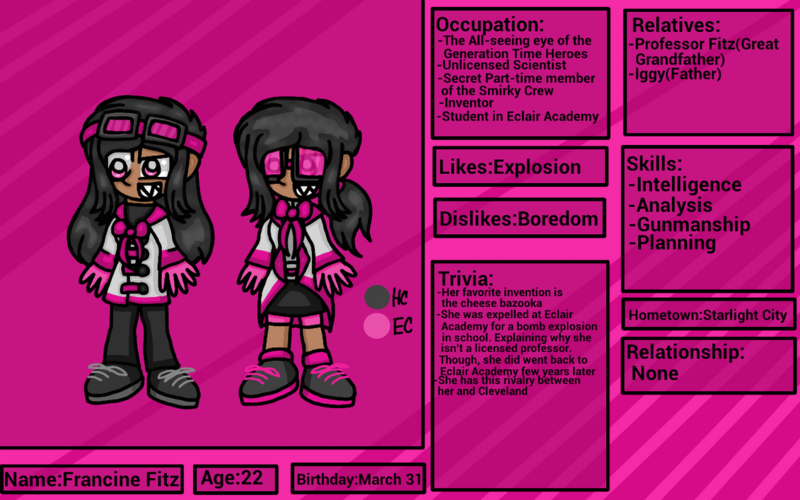 She was expelled at Eclair Academy due to have bomb explosion on school, but was back few years later. One day, she met up with Jillian on Papa's Wingeria. They been hanging out so much that they become bestfriends. She even learn that she's Ninjoy's daughter and she wants to be become a vigilante. So she decided to turn her as a vigilante using her inventions. They even formed Clark and Ronaldo as vigilantes which formed the group "Generation Time Heroes" with Francine as the "All-seeing eye" of the group using the surveillance cameras she hacked. She sometimes worked with Smirky Crew for exchange for money. When she was young, she always love to watch every kind of movies, and she admired every actresses and actors especially Kayla since she was shown emotionless all the time. So she decided to be a actress, but she doesn't want to be known all the time. So she started to have a alter-ego named "Who's that girl?" and started her own YouTube channel with the help of Venus. 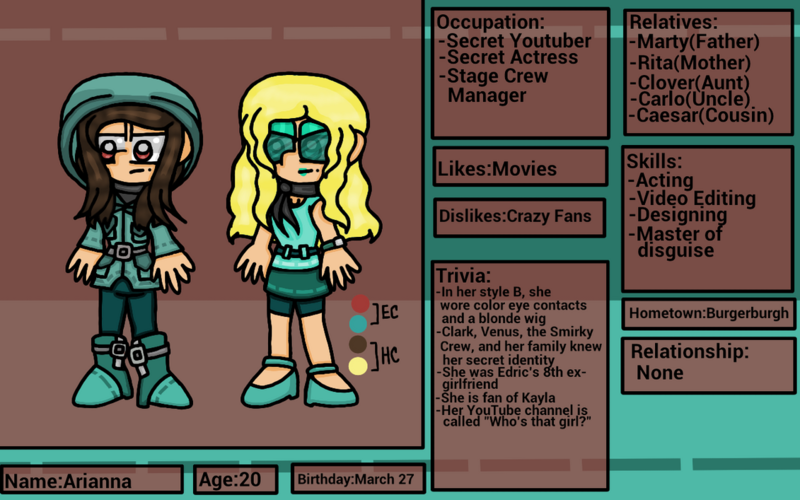 She has tons of subscribers and fans that many want to meet her in real-life. 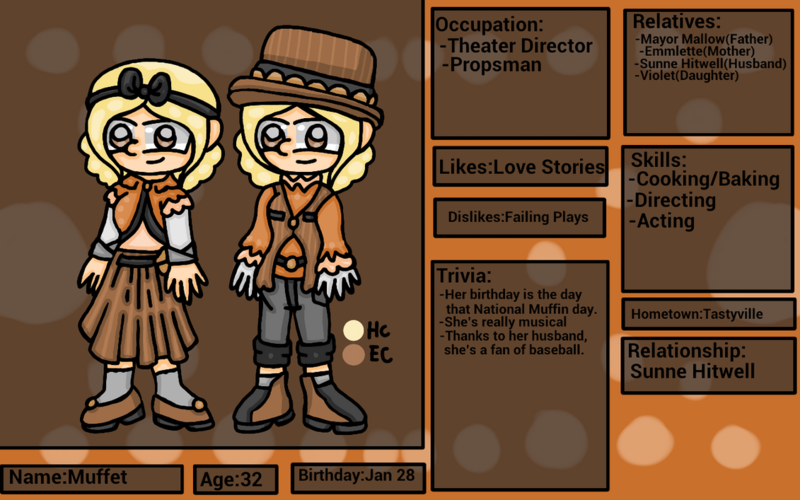 As Arianna, she works at the theater as the stage crew manager who manages the stage for the actresses and actors. Since he was little, he always admired music from his parents who are from different genres. He decided to learn music in every genres, he even learn how to play instruments. 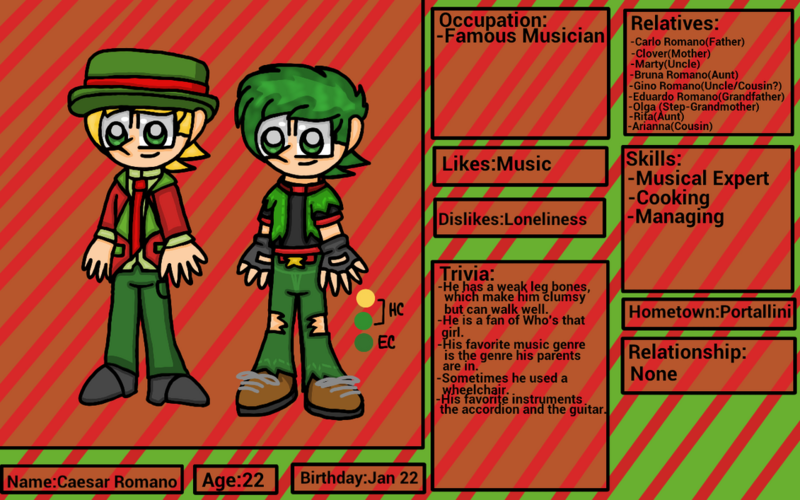 Since he admired music so much, he decided to spread his music around Flipverse in every genres. Many people think he's legendary, but he thinks himself as a normal musician. He sometimes teach some people how to play. He is also clumsy since he was born having weak leg bones. Robin doesn't like talking about his Flipverse life, so it's unknown what his life in Flipverse is. He was hot-headed kid who always tell bad things to everyone including his family. When he was 8 years old, he mystery arrive at X-World unknown. He was ambushed and kidnapped by the assassins, he was taken prisoner for few months. Luckily he escaped but his left eye got injured during the escape. He live a hobo life for two years, during that time...he felt bad for what he did back then and started taking part-time jobs which is difficult for a human, he also learn how to fight whenever bad people came. When he was 10, a newborn baby named Xelena was kidnapped by the same assassins who kidnapped him. He decided to rescue the baby from the assassins. He returned the baby to the X-twins, they were thankful for Robin's work that they decided to make him a squire and a bodyguard to Xelena. During his training, he was discriminated by the other squires for being a human. Luckily Xelena was around to help, which Robin developed a crush on her. When he was 20 years, Xelena was suppose to received the wand in the age of 10 but was stolen by the same assassins. She was depressed for few day, that Robin decided to confront her. For few minutes, they confess that they love eachother and became a couple. For 6 years, they now got married and happily together. At the age of 30, the wand was now returned and Xelena received the wand. Xandra and Xolo decided to take their niece to Flipverse for not just for her training but for her protection from assassins. And so Xelena along with Robin who will protect her, are now in Burgerburgh with Xelena'. foster grandmother. Robin is still uncomfortable being here but he decided to work as a gym instructor in Fritz Frenzy Gym. When he was a kid, he always dream on becoming a baseball player like his dad. So he tries his best to train himself to become one. When he was in elementary school, one of his classmates stole many of the students' lunch money and framed Sunne for stealing. No one believe what he said and thinks he's a liar. Thanks to that, he wasn't accepted to the school's baseball team which led to having no friends. When he was in highschool, he was framed for stealing the test papers, money, and gadgets which lead once again rejected from the baseball team. Few years later, he married Muffin and gave birth to a daughter named Violet. He hope to join the national baseball team like his dad but that's when he heard rumors about him commited a crime by stealing, and once again...he was rejected to all the baseball teams. Due to living a lie this whole time, he decided to be thief like everyone else wanted to with his trusty baseball bat. Few months later, he was caught by the police and was sentenced to imprisonment for 10 years. One day in his imprisonment, he met up with someone named Wayne in the visitor's room. Wayne blackmailed Sunne by paying his fine if he joined the Smirky Crew. Sunne decline his offer since he heard the news about Mercury causing trouble along with Wayne. Wayne gave him the calling card for him to change his mind. After that, his imprisonment started to get harder and difficult. One month later, he called Wayne and accept his offer. After that call, Wayne payed his fine and was released from prison. He later joined the Smirky Crew, at first he didn't want to but started to like working in the group. When she was baby, she always hangout with her older brother Finn. One day, she was kidnapped by the Disco Plumms and raised by them in Munchmore for 10 years. 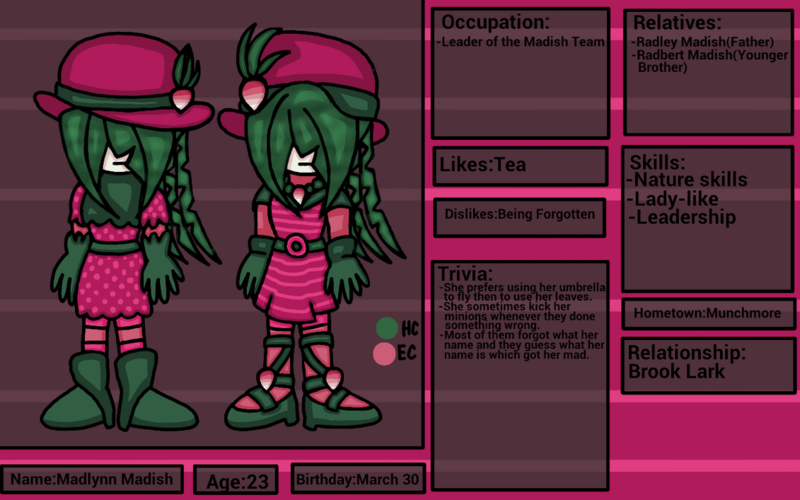 She even work for the Madish Team and acts like a little sister to Madlynn Madish, Pistachio Nut, and Brook Lark. 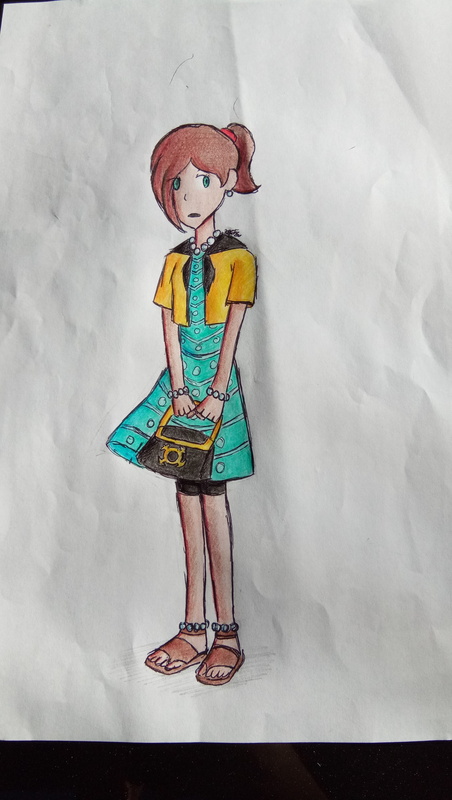 One day, Radley Madish sent her to a mission in Flipverse to spy on customers, secrets, and many more. She met up with Timm which her 'family' hates her and began attacking him which met up with his son, Finn which also started an argument. For many months, she tries to humiliating him and pranking him. Few months later, she discovered that Finn is her older brother and realized she's human. Few days later, she betrayed the Madish team and reunite her true family. Though she might be in her new home, she missed Munchmore so much which lead to coming there few times. Still, it's still unknown if she 'did' betrayed the Madish team or not. 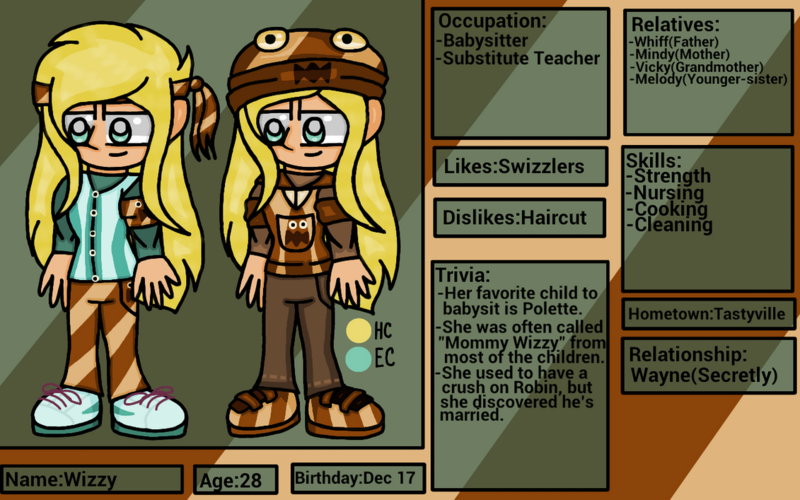 Wizzy is the oldest daughter of Mindy and Whiff. She always been by Vicky when she was a kid, and she feels like having daughter-mother bond with her grandmother. Since then, she decided to start doing babysitting which lead to love taking care of children. She learn to cook, clean, and many more to improve her babysitting. During her time school, she was bullied by the kids in school for being weak. So she decided to exercise which make her stronger as her father. Since then, she continues babysitting and show care around those children which lead to wanted to have children of her own. One day in Fitz Frenzy Gym, she met with Wayne who was exercise too. They hangout eachother and they even started loving eachother which they become a secret couple since Wayne is a member of the Smirky Crew. French Vanilla is a young scoopian with a big dream. 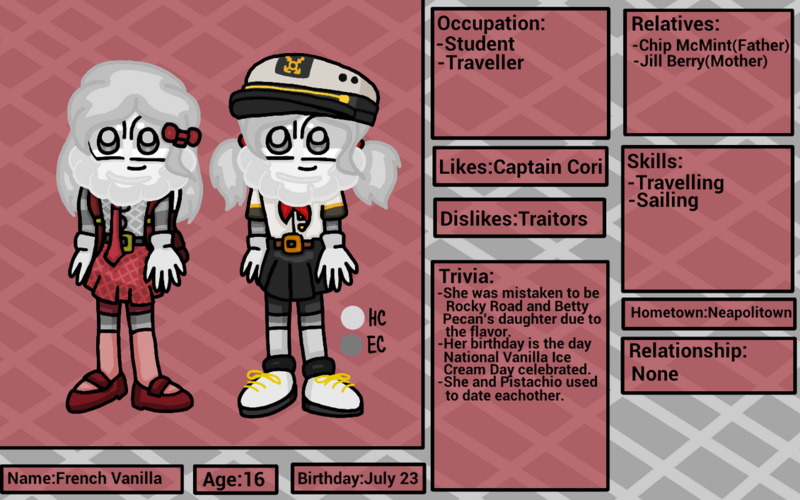 She dream on travelling to Flipverse and meet her hero, Captain Cori. She admired her eversince she heard history of When Sundaes Attack. She always want to be as strong as her that she even want to travel to the ocean with her own boat. When she heard about the Cookie Caverns, she decided to traveled there and she found a warp coin. She used the warp coin and travel to Flipverse. In there, she meet new friends with her best friend Radar. She hopes one day to meet her hero. She was sometimes the forgotten relative in the Louie family. Eversince she was kid, she always have many crushes to the boys she meet. But she never got to be noticed since she was behind Jillian's shadow all the time, which made her jealous that she got noticed than her. She mostly spend time with her dad in Moe's Lair, which got her to love comic books...mostly the villains. She also took computer class and know how to program (and to hack). 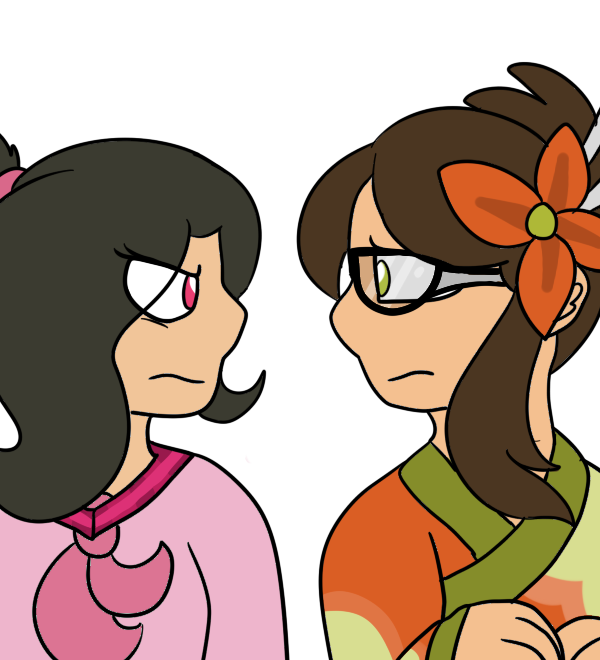 She grew up so much that she grew jealous of Jillian, which made Connie un-noticable. 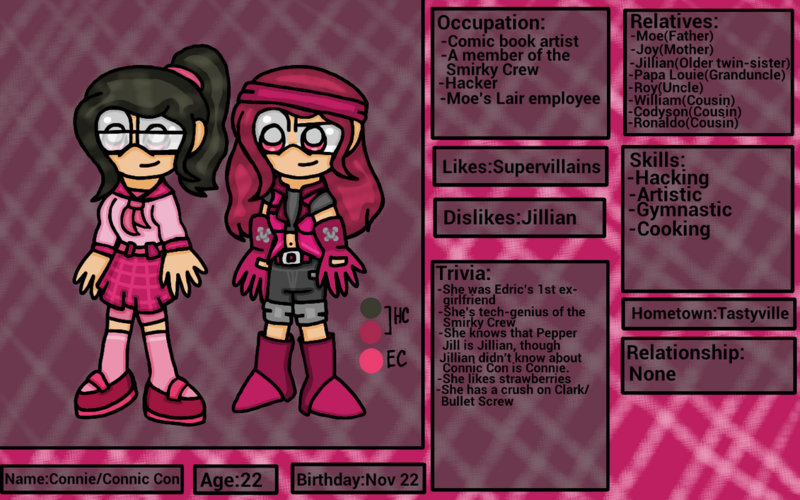 She discovered that Jillian is Pepper Jill, so she decided to become villain like her dad to become her arch-nemesis. She customized her outfit and become Connic Con, and mess around in public and steal. One day, she met Hucklejay and became partners-in-crime. Jillian or known as Jill, she always love the culture in Sakura Bay. So she decided to live there and worked at her grand-uncle's restaurant, Papa's Sushiria. She even took traditional dancing lessons and become a traditional dancer. She was also a vigilante like mother Ninjoy, since there many crimes around Flipverse and showing no justice. She started her vigilante career when she met Francine in Papa's Wingeria, they become bestfriends after that and started there career. They formed a group called Generation Time Heroes along with Clark and Ronaldo. While not doing those careers, she sometimes go to any of Papa's restaurants, eat some cheese, or hanging out with Radbert Madish. Radbert Madish is Radley's second creation and son. Radley wanted him to be like an evil scientist like his father, but Radbert refused to be that role. He always wanted to help the disease and injured people thanks to Rocky Road who taught him to be a good doctor. One night, his father discovered that he was helping the friendly people. Radley got mad at Radbert for what he did that made Radbert run away from home. He used the warp coins and traveled to Flipverse. For many months, he tries to hide himself away from the humans since he didn't want a living radish to be seen in public. Thankfully, he met Jillian who just completed her mission. Instead of attacking him, she help him to feel like home in Flipverse. Thanks to Jillian, he got a place to stay, a job, a disguise, and they even got together. 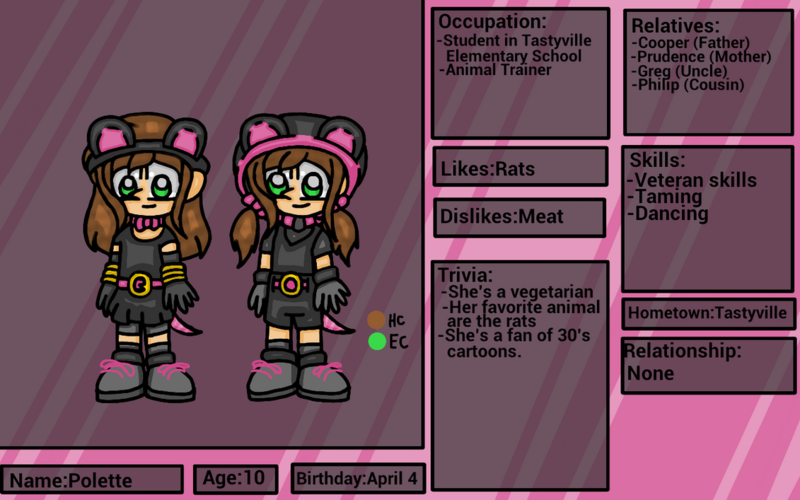 Melody is a famous beauty pageant ever since she won her first pageant at Little Miss Tastyville Pageant at age of 8. She grew up winning every pageant she entered which made her greedy and selfish. She sometimes bully the people who she thinks aren't worthy like Pearl (For being Alistair's girlfriend) and Edric (For being her ex-boyfriend). She also worked at her mother's salon as a hairdresser and she gives fashion advise to everyone. Whenever not doing those, she hangouts with her childhood friend Alistair and skate around. When he was a young boy, he always have a good heart to everyone he meets and his love skating. He wasn't a good hockey player as his dad, but eversince he step on ice...he started to like figure skating. He keeps skating and skating and became a famous ice skater right now. While not doing those, he sometimes have a date with Pearl or hangout with either Cleveland or Melody. 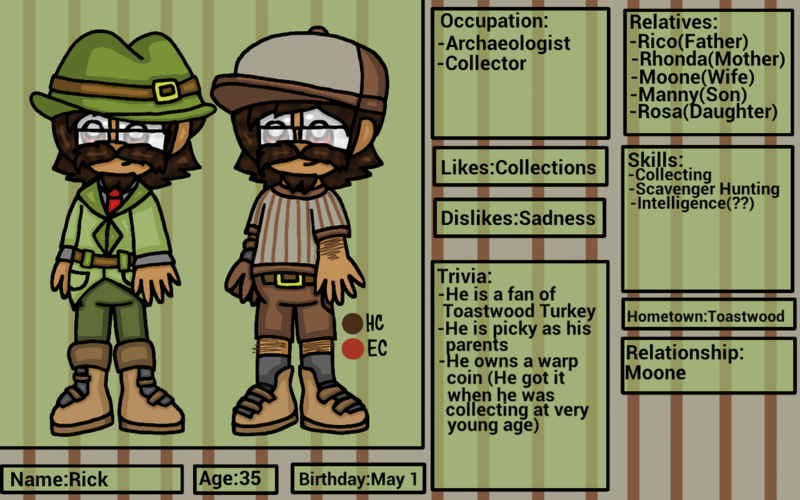 Rick is a sweet and naive man who lived in Toastwood during his days at work and some day off at Tastyville. He grew up liking collecting somethings he found even if it is garbage. He always a fan of baseballs, comic books, and many more. Thanks to that, he started learning to be an archaeologist to find some treasures along the way. 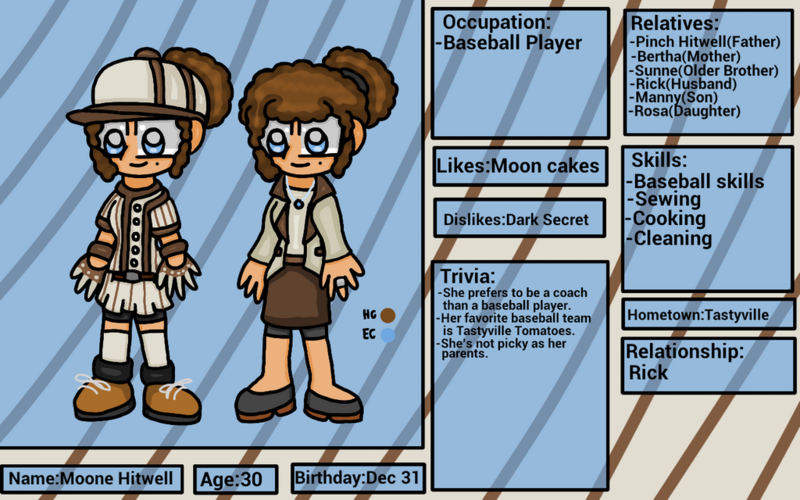 When he started his job as an archaeologist, he met Moone while the baseball tournament. They become friends and soon become a married couple. They even have kids on their own. He sometimes went home to Tastyville whenever a holiday or a day-off came. He might be intelligence but sometimes naive like thinking the Smirky Crew are just a group of friends instead of a crime group. He sometimes a bit of a hotheaded. Edric is smart yet arrogant person. He live in a apartment with his roommate and partner Finn. 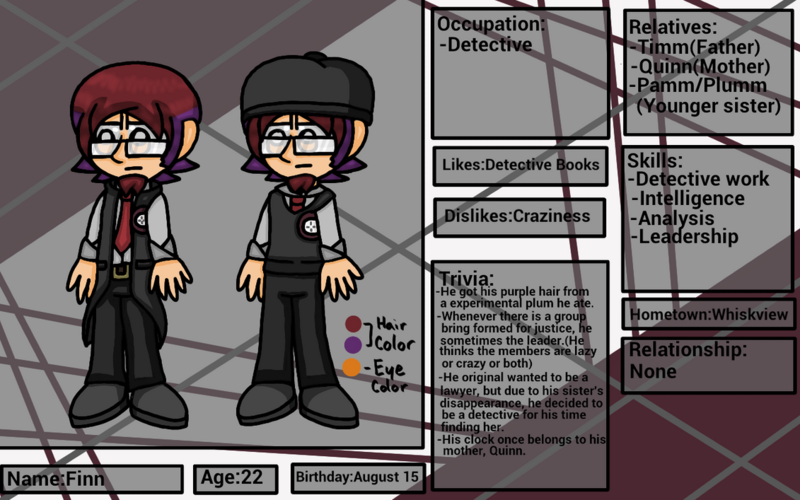 He wanted to solve crimes like his parents but he is a camera-shy so he decided to be a detective. Many girls all have a crush on Edric which some boys hating him for that, but sometimes it ended up hating him for being too arrogant (Some girls have special reason for breaking up). Despite being a detective, many people think he is a 'sidekick' due to getting scared during the investigation and Finn solving more than him. Finn might be hard on Edric for awhile but he always a supportive friend...mostly. Venus is the most popular girl around Flipverse. 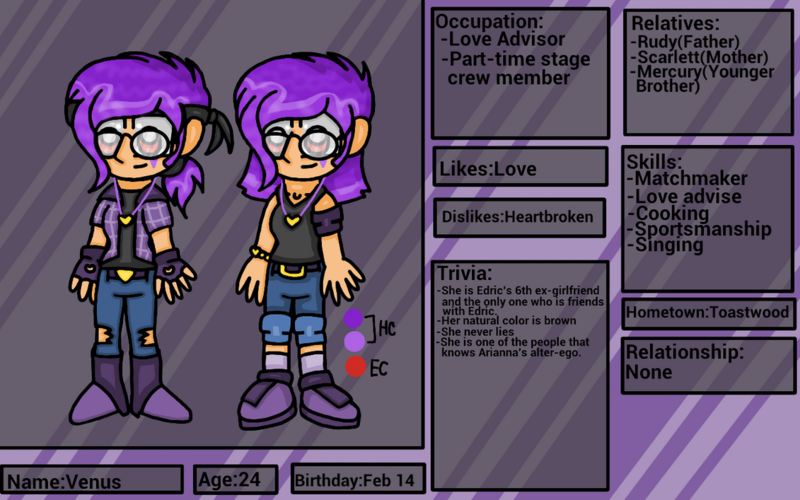 Everyone loves her friendly and loving personality and has many friends including Edric and Ariana. She's a love advisor at the radio station and her advice gave many successful couples but she sometimes give advice from her ex-Boyfriend and Friend Edric who's depressed on being lonely. She's also helpful to everyone. 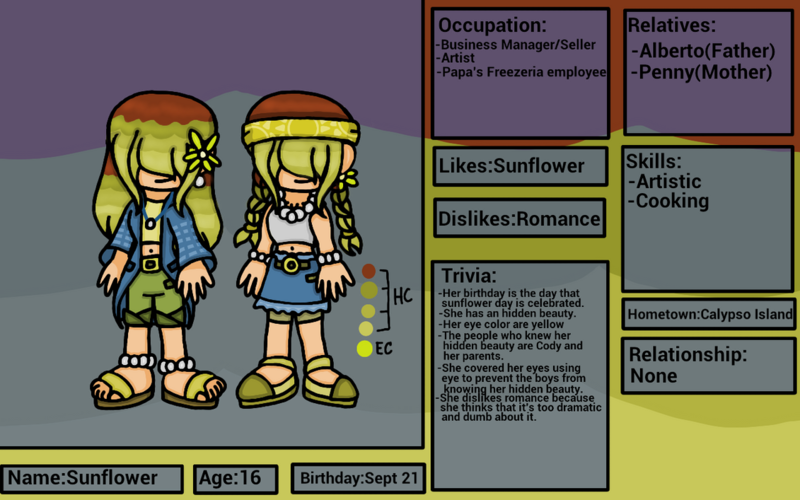 Despite being friendly and popular, she's also naive and thinks they are doing good like her younger brother. Sergeant is rebellious young highschool student who roam around Oniontown causing trouble. He sometimes like to scare everyone including his sister using his scary handmade face mask. 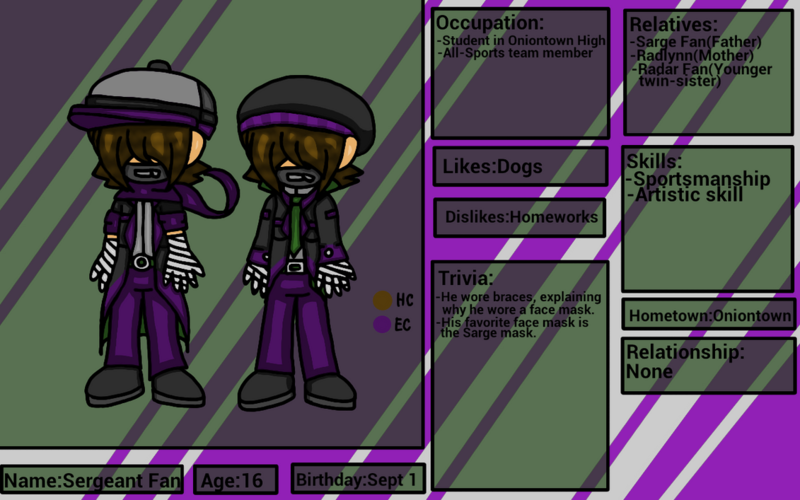 Despite all that, he's actually Oniontown High's favorite sportsperson due to him being in every sports team. He is really fast and strong on the same time but sometimes it ended up getting himself hurt like his arms. Though he might be good at sports, but he's bad at academics. He really artistic and many likes he's mask that he made. Whenever not doing all those, he sometimes hang with Cody or watch some sports games including baseball. Polette is sweet little girl who enjoys being around with animals thanks to her parents and their pets, Cookie and Pickles. One day, she encountered an injured rat and decided to heal him up. For many days, the rat never left by her side so she decided to keep as her own and named him Mickey. Thanks to that, she decided to help some injured animals even the wild ones. But sometimes she ended up causing trouble when helping some animals. Whenever not doing those, she hangouts with her cousin Philip and her best-friend Plumm who they called themselves The Three Peas In A Pod. 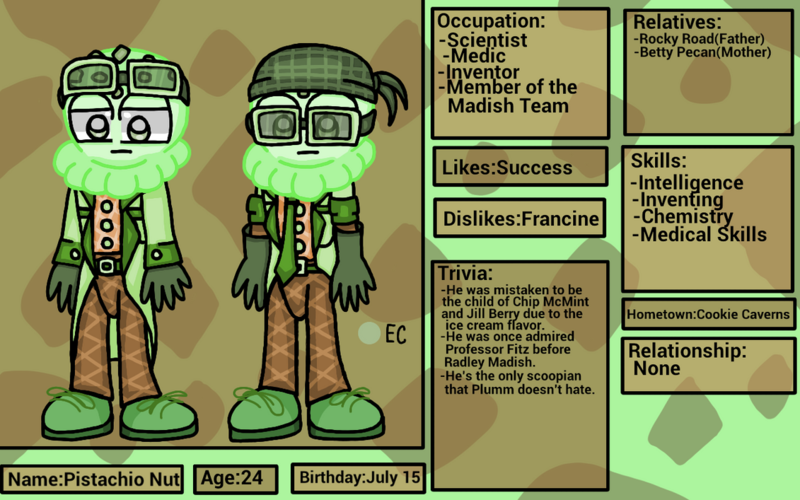 Pistachio is one of the gifted Scoopians in Neapolitown thanks to his parents, this got him to joined the famous group of scientist on a very young age. Everything was great until he noticed Radley Madish and started admiring him, which got him to experimenting that could lead to bad things like the time he blow up the lab which got him fired. He was so angry that he decided to be a decent bad Scoopian. 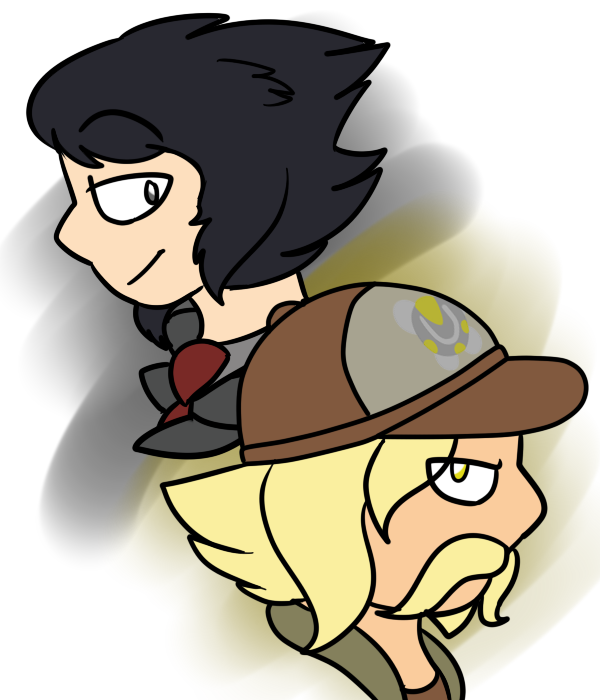 One day, he tries to steal one of the artifacts for his experiment until he met Brook the Brussel Lark who's trying to steal the same one. They escape from being caught and they become good friends. Brook decided to recruit him as a member of the Madish Team, Pistachio accepted and became the main scientist of the team. 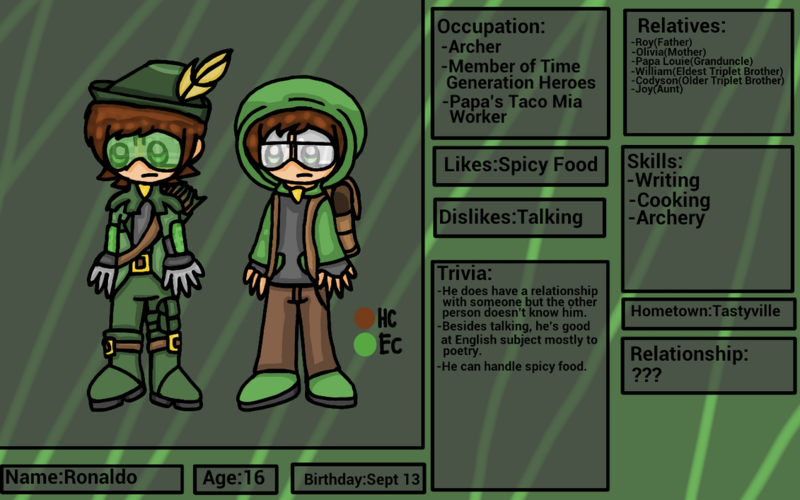 Radley Madish created a living radish name Madlynn that can control the nature like vines and roots, but after a year later that he discovers that his child was weak on her powers. He decided to create another that his powers are stronger. Thanks to that, Radley Madish pay for attejtion to his son "Radbert" while Madlynn was in his shadow this entire time she grew hatred against Radbert. She learn herself to be a lady-like person, manipulative, and show leadership. But sometimes she show a soft-spot like having Plumm around who she imagine her as a little sister. She even got herself a umbrella as a weapon. When her brother left Munchmore, Radley Madish now focuses on Madlynn and made her the next person to lead. 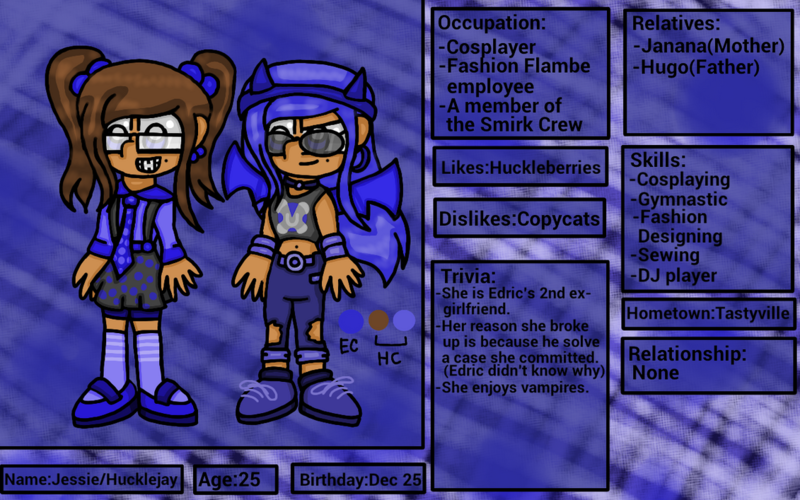 She accepted it and decided to made a team called the Madish and hopes one day to takeover both Munchmore and Flipverse. 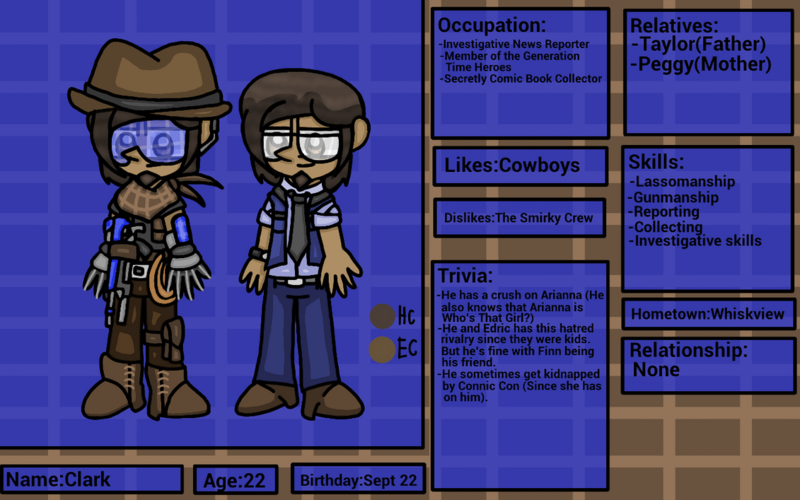 Clark is a well-known reporter in Whiskview, many people loved to see his report in the news especially the time when accidentally apprehended Sunne Hitwell during the news. He was so famous that he would have won the Windie award if he didn't gave a false news about the fire in the fire department which almost got him fired for that (Thanks to Mercury). Even though he is famous, he actually has many secrets that no one should know of like that he was secretly a comic book nerd that enjoys reading superhero comics and collects some action figures but also that Clark is literally a superhero. He didn't expect to be superhero until he was kidnapped by the Smirky Crew due to wanting him to be a member of the Smirky Crew but he luckily escaped on his own and fought the members, and suddenly was saved by Rock de Rolll. They become friends after and Rock de Roll suggest that he would be a member of the Generation Time Heroes. He accepted and was known as "Bullet Screw". She has been famous baseball player since she was first play at the rookie league. 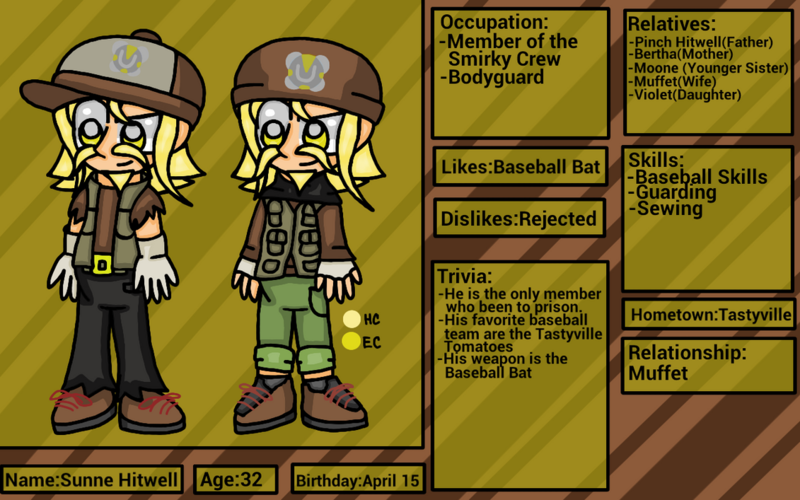 Everyone looks at her as Pinch's successor to play baseball, but she doesn't think of herself as Pinch successor since she wanted her brother to be the successor. Her parents understand about it and wanted Sunne to be the successor. She tries her best to convince Sunne to gave up his criminal deeds, but no luck. Despite her time, she has time for her husband, Rick, and their children. She also enjoys sewing clothes as a hobby. Despite his look and age, he is actually a responsible kid that is capable on handling without the need of a mature adult. He can cook, clean, and many more like a mom. His true passion is to become a baker and own a bakery in the future. Whenever not doing those, he can interact with his favorite cousin Polette and his new friend Plumm. Herbert is passionate person who wanted to be an well-known artist like his parents, but due to having family financial problems...he decided to become a police officer for the money. He doesn't hate his police job, but he does have low salaries but he is great police officer. When he heard that announcement from the chief about capturing the Smirky Crew members will received the high ransom money, he hunt down the Smirky Crew members for the money he needed. He may not be an artist but he did sell some of his paintings to the others which includes his childhood friend, Jessie who they meant in art camp. Like his aunt and cousin, he is a vigilante known as Ojo de flecha. He is just like robin hood, with his bow and arrow which he used to fight crime. But as his civilian form, he's is known as Ronaldo who is a bit shy and quiet that no one heard his voice for many years. He prefers writing and archery but he has trouble being around with people, which they decided for him to work at the kitchen then the counter. The only people who are close are his own family and Clark who they know for being pen pals. Like her father, she's really joyful and like her mother, she's really dramatic. She has been loving the theater thanks to her mother and decided to be theater actress for many years. As she grew old, she decided to be a director and helps the people working in the play. She's also one of Arianna's helpers on her acting videos, she incharge in directing. As she went home, she can spend time with her daughter and hopes one day her husband came back. Joanna is Jojo's granddaughter and successor. She wanted to be a food critic like her grandfather, but she has trouble with her fear of judging and giving critiques. Luckily, she has friends like Mia and Mabel and her family like Benedict. She sometimes wrote her notes for future needs. Mabel is an environmentalist who has the thing with nature ever since she was a kid. She always view the world her home and wanted to protect it from danger. She always encourage others to do the same for her to live a normal life in this place. She always ask help with her grandfather to save the environment...even though they are not exactly related. 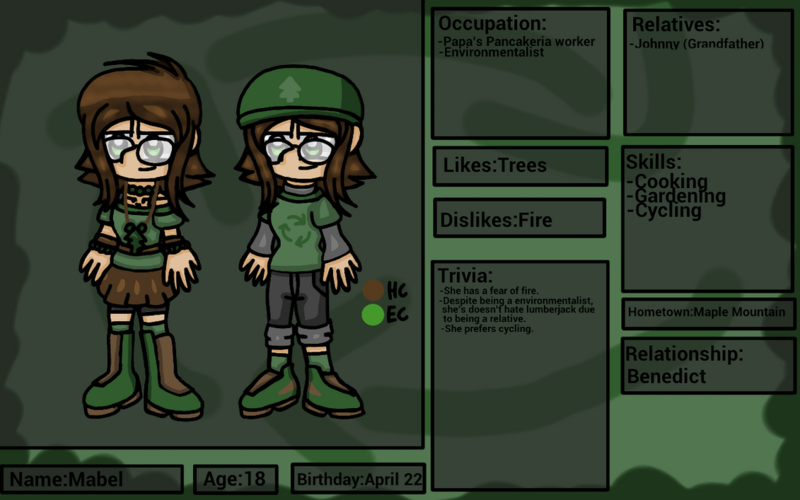 She can be seen in the forest, in her job as a Papa's Pancakeria worker, or with her boyfriend, Benedict. 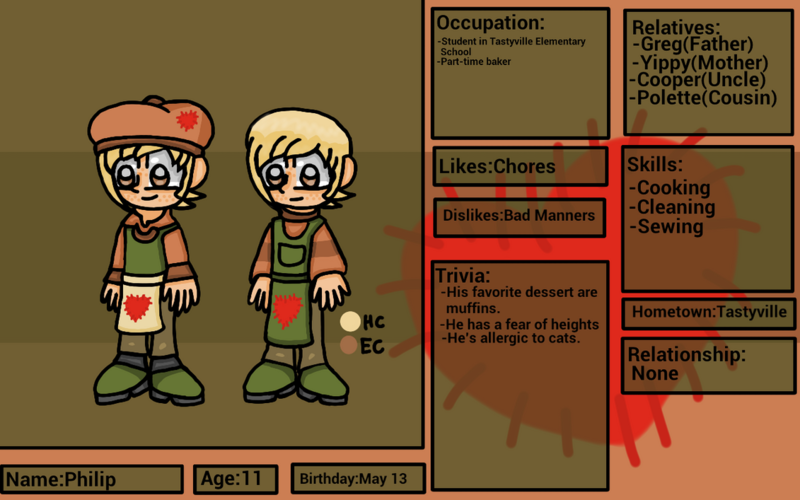 He is Roy's rebellious son, Codyson or Cody is one trouble teenager that causes trouble around. He doesn't really care much anyone but his family, which many people doesn't like him. He doesn't like show his true feelings to others, but he does help his brothers and has a crush on Sunflower since he saw her face. He does have some creative skills on arts but he is more in creating tattoos, which causes to have his own little business. Unknowingly to everyone, he is friends to some criminals especially to the Smirky Crew. He is the eldest son of Roy, which he is the next head of the Papa's franchise. Thanks to that, he was inspired to become the next head and was mastery taught how to cook very well. He went to every Papa's restaurant just to work there which he does this every week. He is really popular among everyone, but he always cares about his family especially his two brothers. Outside from work, he hangouts with his Munchmore fan friends, with his brothers, or addicted playing Sliders. Cindy is talented ballerina who often gives everyone a smile. She was taught to be happy and cheering up others thanks to her father. She performs ballet shows around Flipverse, which got her fame. But she always wanted to feel normal like being a dance teacher in her mother's studio. Everyone loves her for her kindness, which is the reason why Finn and Cindy were together. Mangga is a young beautiful woman who is into anime and manga and not mention...mangoes. She admired her dad and his hacking skills, she decided to be a hacker but wasn't skillful. When chemistry came to her, she loves doing chemistry especially to fruits to become a forensic scientist. 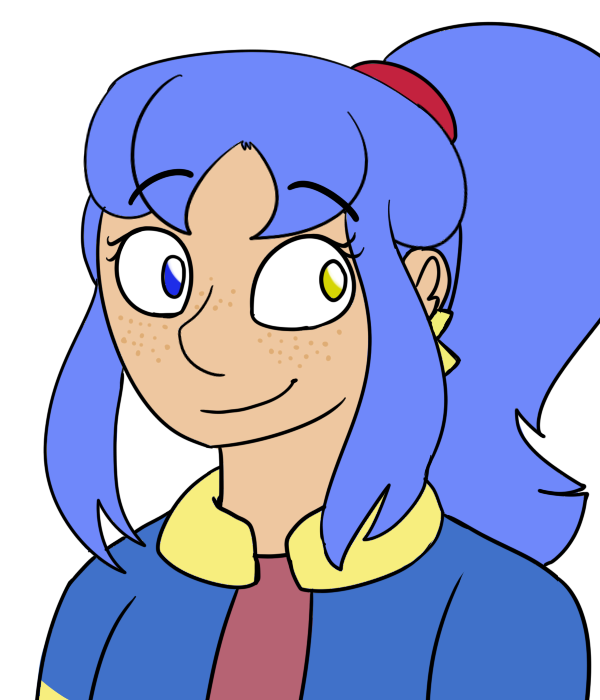 She sometimes works with Edric, Finn, Herbert, and Clark. She can be seen in Whiskview Mall who she enjoys her break. He was originally lived in Starlight City, but after he, Francine, and his parents when to Frostfield to visit them...they forgot about Cleveland being there. Of course his grandparents call them to pick him up, but while waiting...he enjoys being in Frostfield especially the snowboarding. His grandparents even enjoy his company, when his parents came, his grandparents decided for him to stay in Frostfield. His parents agree and let him stay in Frostfield. 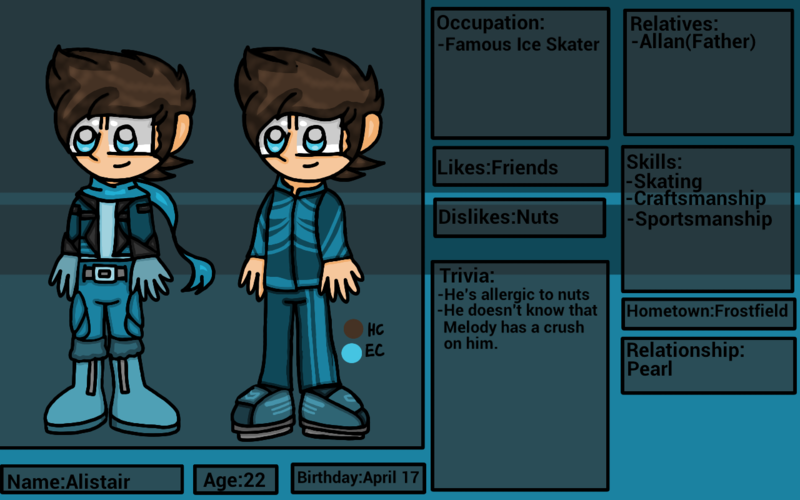 He loves being in Frostfield despite the trouble he cause, he is lucky to graduate in highschool. He spends his time doing snowboarding when snow came along and sometimes won awards. He can be seen working as mailman like his grandfather and when not working on something, he sometimes visit Starlight city. 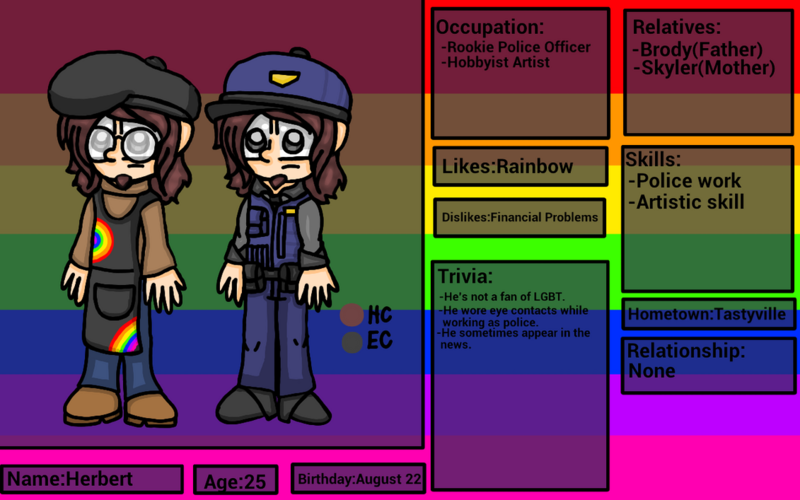 Thanks, i'm still working on the rest and i'll add the bio whenever i'm not busy or lazy. There's a poll on who will be getting the next profile. I'll do Mia first. I decided to change it since their old ones are not good enough. Like i said, some are revised. Some are just gonna stay in their own outfits. Also, thanks. 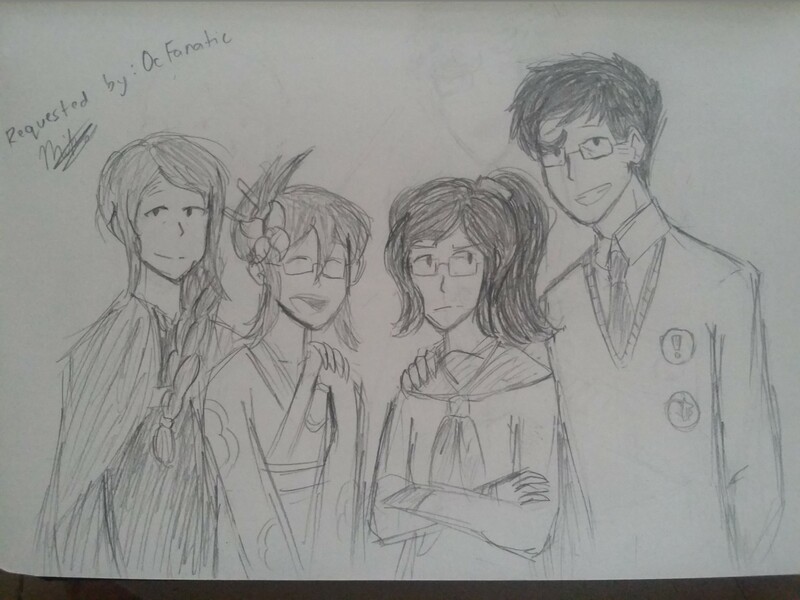 You're welcome!And I kinda want to redraw my offsprings as well. I want to see it!! 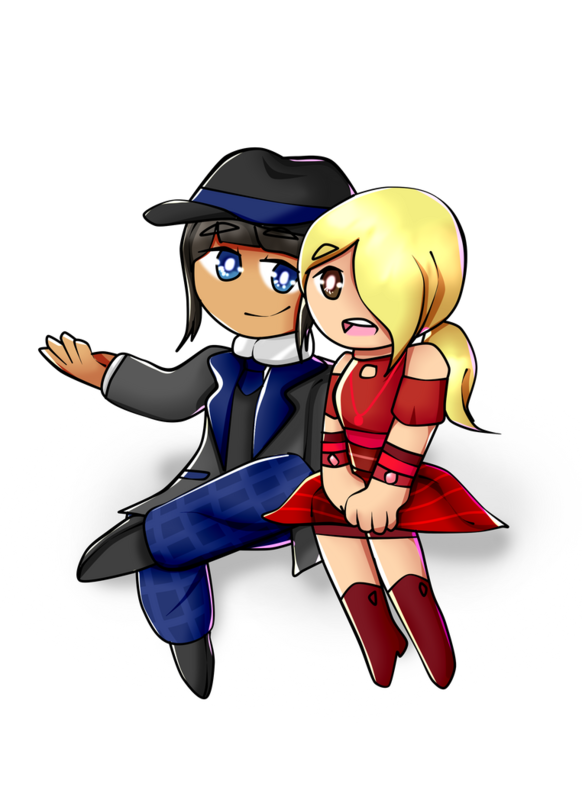 To be honest, I want to showcase my NG in the deviantart but I'm not ready for it because i'm still new. why not show them?You don't show them just because you are a new deviantart member? I'm still shy to post it now, maybe when summer is here. It's just one more week left and i'll have summer. Mia is now here and i just added Pearl's an Hucklejay's biography. 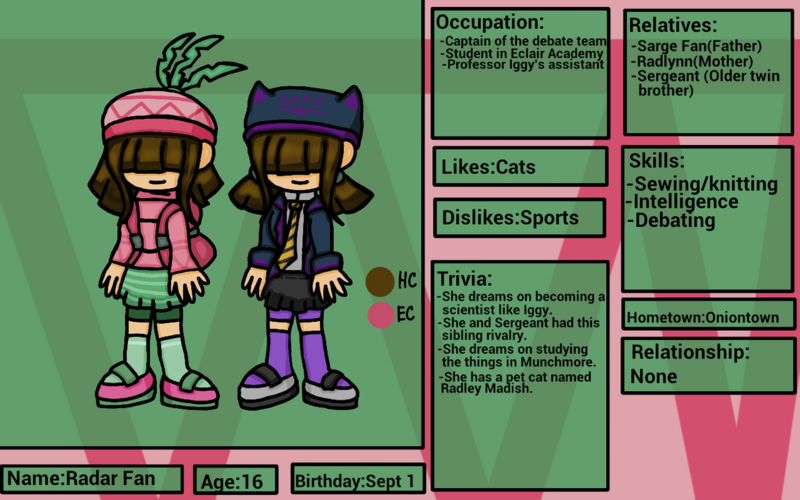 Updated Mia's profile, and the poll has now two choices.